The focus of the lake association has always been to maintain or improve the quality of the lake. A lake management plan was discussed by the association as early as January, 1996. 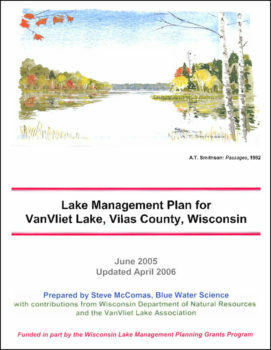 At the 2003 annual meeting, the board was asked to look into the possibility of developing a lake management plan for Van Vliet Lake. During the fall of 2003, requests for proposals were sent to more than two dozen consulting firms. After interviewing the top three candidates, Blue Water Science was selected to work with the association on this process. In February, 2004 a grant request was filed with the DNR which was approved in May. Studies were conducted throughout the summer of 2004. A final report from the consultant was presented at the 2005 annual meeting.